Zinger Digital Signs video wall controllers are simply the best and so simple to install. It comes preconfigured and preprogrammed for each wall pattern and ready to use out of the box. Our wall controllers are built with HP commercial servers, and backed by a 3-year HP warranty. Our controllers also include “award winning” Userful Video Wall software. And with all our controllers, you can easily add additional displays, including stand-alone displays and interactive displays, all easily controlled through a web browser, smart phone or tablet. And our controllers are simple to use and include free training. The most economical, expandable and easiest to use video wall system on the market today. Ability to expand the solution easily in future. Network architecture eliminates clunky video cards or specialized interconnects and cable extensions. The solution ensures a long-lasting video wall that is easily upgradeable as customers seek higher-resolution content in the future. The same server that supports the video wall can support other digital signs, interactive displays and desktops including signage replication for the same content stream synched across multiple displays or video walls. It’s all delivered in real-time over a standard Ethernet network, providing unparalleled flexibility. Userful offers a full suite of remote control tools which staff can use to invoke zone and content presets created by Administrators. One touch on a tablet or smart phone can change content and zones across all video walls and displays connected to a single PC. Manage the solution easily from a browser or smart phone. Scales easily — Simply plug in additional zero client device players to expand the number of displays in your network. Increased life span — Zero client player devices have no moving parts or operating system, making them long-lasting, even for demanding or harsh environments, including high heat, grease, dust, steam, and outdoor elements. Content management — The solution integrates natively with RiseVision content management software can display content from any CMS using HDMI capture. HDMI capture — Optionally add one or more HDMI capture cards, allowing input of just about any source content. Solution controlled entirely through the browser — Set up and control video wall using either smart phone or tablet with drag and drop browser-based management tool. High availability — Install an optional failover server to ensure continuous system availability. Preset zone support — Display simultaneous content streams on specified displays within the video wall and change on the fly as needed. Preset switcher — Use a phone or tablet to quickly and easily switches between multiple content sources and video wall layouts preset by the video wall administrator. Other types of displays — Support stand-alone digital signs, touch kiosks, or desktops all from the server that supports the video wall to create a complete digital display solution. Mirror feature — Synchronize content across multiple displays or video walls allowing the same content to play at exactly the same time. 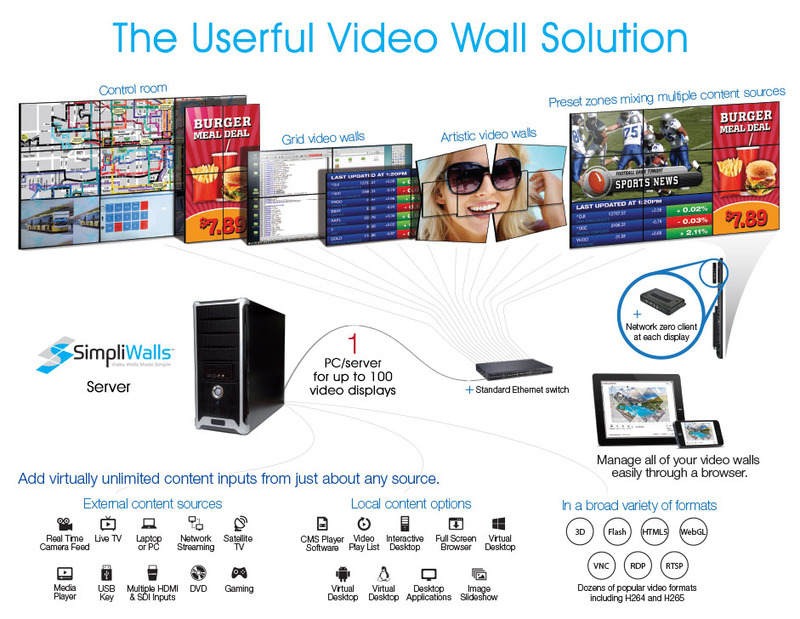 Make any video wall a touch video wall — Any tablet or smartphone can control the mouse and keyboard of the video wall making interactivity with a Userful video wall easy.